The VHP-Bajrang Dal have called for a nation wide bandh tomorrow 3 rd July. Today the VHP and Bajrang Dal will take out a rally in protest of the J & K govt decision to take back the land allotted to Amarnath board. In a press release, they also said that Belgaum would be BANDH on thrusday as a part of the nation wide bandh called. Rohini Patil will be representing India at the Asia Junior judo championship at Yemen. Dr.G Ravishankar the new DC for Belgaum took his charge yesterday. 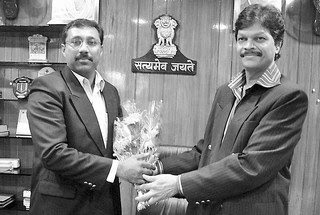 In the picture is Dr.G Ravishankar (Left) and presenting him the bouquet is the CEO of ZP N.Prabhakar. 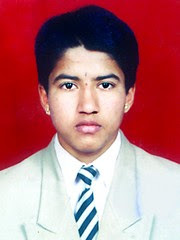 All photos from Tarun Bharat.